I did a simple survey asking visual effects and animation professionals about their working conditions. Keep in mind when I ask about working conditions many are surprised, even at the VES board meetings. Many of us do work in places that provide reasonable working environments and that do follow at least basics of the labor laws. But keep in mind this is a global industry. Your experiences are not the same as everyone else's and just because you may not have experienced something, doesn't mean it doesn't happen. I've heard reports of beatings and other issues in places such as India and China. Even in Los Angeles there are companies that do not pay overtime nor do they provide reasonable working conditions (air conditioning, etc). Much depends on the quality and level of the company you work for. Also keep in mind you are likely to be required (requested?) to travel half way around the world to keep working. Will the company there be providing the same level of experience as you've grown used to? As vfx companies continue to be squeezed don't be surprised if the companies start making even more trims to not only your salary and benefits but you work experience and environment as well. Safety is one that people seem to take for granted. Are there ethernet cables and power cables running on the floors where you work that people might trip on? Are any of the exit doors locked for security or other reasons? Is the stairway door blocked with old computers or boxes? Is it in a good area of town? Are there tall cabinets or hanging 'models' that might fall in an earthquake? Was a warehouse or old house quickly converted to a vfx company workspace? The first question of the survey was about priorities. This was the level of concern or how important it was to the professional. From none to Highest (essentially 1-5). What are the important issues to be considered when working at a job or considering to take a job? Brackets are added comments from me. The second question was about how well the company you work for meets those concerns? If a pension was high on your concern list but the company did not offer a pension plan, then it would be rated None. 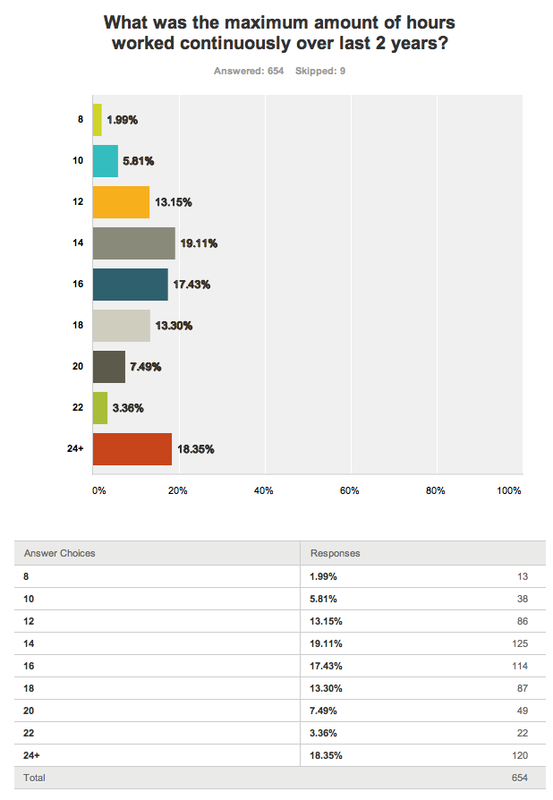 The following are a list of the comments from respondents who answered Other in either question. The first list is those who commented on both questions (priority and company). After that are the comments regarding only priority question and last, comments regarding the company meeting those demands. Comments in [ brackets ] are my responses. Priority: having a notice greater than 2 weeks before getting fired. Company: Appreciation for work and a supportive environment focused on quality work. Priority: Health Insurance Coverage is through the state, although I worry a lot about paying the Coverage! Company: Cant Answer for Credits and Credit placement yet, as movie not yet released. Company: had to leave loved ones behind and relocate to canada to work at this company. great studio, loved the work i was doing, but very lonely personal life. life outside of work just wasn't satisfying/happy enough, so chose to go back home. now struggling to find work at home. wish I didn't have to choose between a great work life vs a great personal life. Priority: This company went bankrupt. Company: This company went bankrupt. Priority: I put None for Health Insurance because I happen to work in the UK where we have the NHS. But, if I have to keep moving around the world like I have over the past 10 years, this may change. Company: - Not compensated for overtime at all. Most people (everyone?) in London, UK are on day rate. - No pension that I know of. - Not sure about film credits this time around. The last time I worked for DNeg was years ago, and I did get credit then. Of course, it was below the catering. - I am misclassified: have a lead title informally and a senior artist contract. Priority: Needing to move has been the end of numerous relationships and even a Divorce. I've taken my own steps and sacrifices to minimize this but it's a major issue for most. 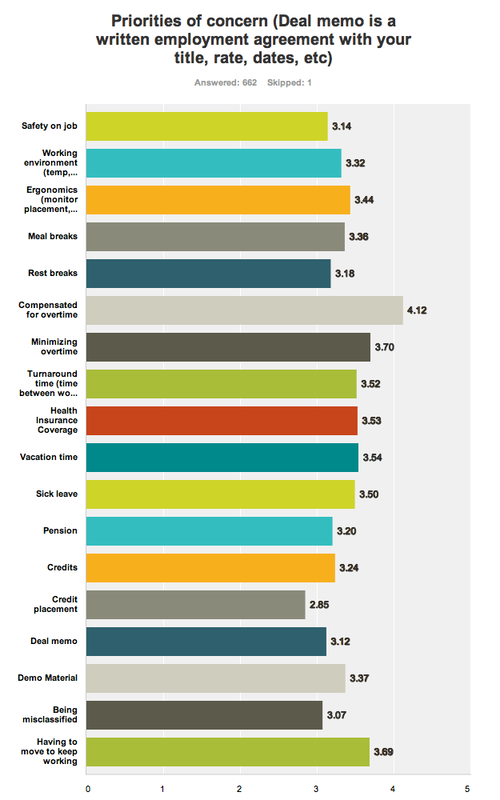 Company: Most work is low difficulty Not involved in creative talks or meetings. Hired as a grunt worker to pump out finished characters. Priority: I think this is a little miss leading because it assumes that everyone has experienced these situations. I for one have never been "misclassified" And NO ONE can ever offer complete job security. [I'm not making any assumptions about what people have experienced. What are your concerns, priorities, etc? Company: I believe we as artist also need to look at ourselves. Everyday I see everyone around me wasting countless hours and taking 4 hours to do something that should only take 1. If we would simply work with integrity then perhaps we would not be in as much of this mess as we are. Not to say there are not sweatshops out there but we cannot put all the blame on them. Company: VFX supes treated employees like servants, not collaborators; lots of going to the top of the org chart for concerns that could be resolved with more directly-targeted phone calls; complete mayhem on a project where people slept over in the building to complete a botched job by another division; bad integration of recently-acquired facilities and existing employees. Priority: If the environment is abusive, I have quit with minimal notice. In one specific case, I was threatened with being fired, and then the supervisor asked my coworkers if they knew anyone who could replace me. Company: Some of this is the difference between previz in a production office and previz at a vfx or commercial house. Because production offices are temporary and on location, they tend to have older office furniture. VFX and commercial houses tend to have better, ergonomic chairs. Priority: I think marking pretty much of all these items as a "high concern" has made me realize this list should be retitled to "reasons to leave"
Priority: Salary scale model for all studios to use via standardization with min 3% salary raise. Priority: Compensation fee schedule for canceled bookings, Penalties for truncated or extended schedules. Priority: Highest. Priority: How the management treats the artists personally. Priority: Having to recover for sick days even thought they are specified on the contract Having more duties than specified on the position and being told that I don't deserve a promotion and the minimum salary for the position. Priority: Less everyday working hours! Priority: Can no longer find work in Florida. Too much competition with college grads which has severely lowered wages and increased competition for the few jobs available. Over 18 years professional experience and struggling to find suitable, stable employment at a reasonable wage. Priority: i am afraid i seriously am not understanding what the above represents; MY concerns or the concerns of the company as represented by the deal memo? the wording of this is vague at best. i have responded to the survey above assuming it has to do with the deal memo content. Priority: When facilities ask me to bring in assets from other jobs they know I have worked on. I have refused to work at certain place where someone asked me to bring in something. Priority: Re: Health Insurance / Pension - I secure my own, so provided the pay is high enough to offset those costs, they are not concerns for what positions I seek. Priority: Its all about quality work and being treated as a human being. Priority: Top concern - unpredictability in length of contracts, location of work, viability of companies, future of industry. Priority: moving is NOT an option for me (or my family), so "NOT having to move for work" is "required"
Priority: I'm 50 yrs. old. I can't keep moving for the job. I need time off. I need a vacation. I need a like. Priority: Quality of project. Experience and learning. Who i am working with. Money. Priority: Experience and expertise is considered a detriment more and more. Priority: Consecutive days worked is a big problem. Priority: Not sure what a deal memo is. Priority: Why would being force to move to keep working be a requirement that anyone would want? Priority: Movable start dates without compensation. Poor communication about end dates. Priority: Loss of VFX jobs in and around the Los Angeles area, and the length of unemployment between contracts. Priority: Working on good scripts and challenging movies is very important. Priority: Lack of will power, or maybe power in general, of vfx houses to push back on studios/clients regarding feedback and notes. Endless revisions and complete changes of mind on clients part. Priority: No mercy for working moms. Priority: Confirmation about availability is required. Currently only production side can has confirm, but worker can't. Priority: Highest concern is the frequent layoffs and employers unable to guarantee work for more than a couple of weeks. Company: In the last 2 years I have worked in Sydney, London, UK, Bergen and Perth. What I have answered here applies to all places. Company: We get no overtime pay (exempt, full time) but do get royalties. Company: I am currently working outside of a production environment since few jobs in animation remain in L.A.
Company: Haven't had to move… yet. Company: I think what you're doing is a giant waste of time. It's the not MY responsibility to force a company to do what *I* want. I can work in another industry if I don't want to work this way. I'm so tired of the whining. How about getting VFX companies to simply be run by normal human beings instead of people who will take any job for any price so James Cameron will visit their facility? The problem with the industry is not going to be fixed by a union. It'll be fixed when all these terribly run companies go out of business and ones with sound practices take their place. [ First the survey doesn't force any company to do anything. It's simply trying to get a guage of workers around the world. As to getting them to work the way YOU want - you have no problems if companies break labor laws or treat people poorly? So should those who have been beaten not mention it since it would be whining? "It'll be fixed when all these terribly run companies go out of business and ones with sound practices take their place." Company: My last employer was a pretty good place to work. This is not typical. Company: We actually got paid day-rate only. If we worked weekend we could take day-rate or comp day. No per hour OT. Company: You don't have a place to put notes for items 4-10, so I am putting it here. In item 9, [Overtime compensation] I have to put down that I am paid a flat, because I am a salaried employee. 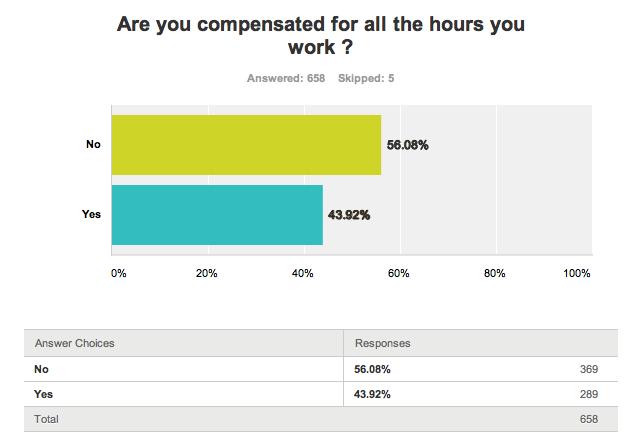 But in item 8, [Are you compensated for all the hours you work? ] I feel like I am more than adequately compensated for my overtime, because I factored that into my salary negotiation, and I am paid what I think my time is worth. The important point here is that you don't have to be paid "overtime" per se, at an increased hourly rate, to feel well compensated for your additional time at the office. In fact, having to punch a timecard to keep track of my time would be annoying as hell. In my current situation, I come and go as I please, as long as my work gets done. I prefer that over some kind of crappy union timecard punching situation. I've done that. It's a system that works well for mediocre people who can't demand their own deals.It's not for me. [ A flat rate is fine when both you and the employer know what the time required will be and if it's consistent. What happens when your employer requires the entire project to be done working 16hr days, 7 days a week? Did you factor that in? Does anything in your contract prevent that from happening? When your time is fixed there is no incentive for the company to avoid overtime. It's actually more cost effective from their accountants stand point to have you put in as much time as possible, since that's all free to them. "I come and go as I please, as long as my work gets done. " The problem is for most people working in vfx it is a team effort. In those cases people can't come and go as they please, they have to be there to make sure the work and hand offs are made. "punch a timecard to keep track of my time would be annoying as hell." First there are other methods of tracking time than punching a timecard. Second, so the company has no idea how much time you actually put in? Without knowing how much time you and others are putting in how do they determine how much to bid? "It's a system that works well for mediocre people who can't demand their own deals." Company: It should be noted that I currently work at Dreamworks and am therefore covered by TAG. But I am still very much concerned by and supportive working conditions, rates, and guild membership for all of us involved in the field. Company: Too many work hours. Company: I had different treatment in my previous country, in France. I kinda threaten of legal action my employer before leaving so I get every single hour paid, with special rate and stuff. Because the first month they tried to paid me really low (nothing actually at first) because I was 'on training' .... So I write a letter summing up a very accurate timesheet, stating roughly : Pay Me. Company: I am not in the US. I work at a company in a country with a national health plan. The company doesn't provide it, but doesn't need to. Company: I'm not sure I understood this question correctly, so I answered as if high means the company is meeting my concerns, and low if not. Also I have no idea what deal memo is. Company: This is kind of a mixture of my current employer, with whom I recently started work, and my previous employer. Where I don't yet have experience with how my current employer works (like credits or demo material - basically the last 6 lines) I've given a response reflecting my previous employer. I think there are quite a few similarities in the comments, no matter where in the world they came from. Keep in mind the film business is all freelance. Film crews go from one project to another (just like actors, etc) and have gaps between employment while they try to locate additional work. That's one of the reasons why film workers are paid a bit more than similar workers in other industries. It's also one of the reasons why they are unionized. Many in visual effects have gotten used to the idea that visual effects is a permanent position and the amount of work is a constant. As always please leave comments if you have additional thoughts. [Update: What follows is the details of the survey and then final summery at the end. I'm adding some of summary results here for those who simply skim. Keep in mind a regular work week for most countries is 40 hours. At 100 hours that's 2-1/2 times the number of hours per week as a regular person has to put in. That's over 14 hrs a day even if you work 7 day weeks. Equivalent to 20 hrs day if it were a 5 day work week. Also keep in mind most countries and fair trade organizations have a cap of 60hrs a week total. Anyone putting in 100hrs in a week has exceeded the limit in most countries by a full weeks worth of labor on top of the maximum. This also wasn't simply for 1 week for most of those working. In New Zealand 13% of the workers put in long weeks for over 10 weeks. 19% put in 8 weeks of heavy overtime. 10 weeks is 2-1/2 months or likely 70+ days non-stop without a day off. While New Zealand was the highest, most countries far exceed regular labor limits. Details in the survey and end summary. I conducted a simple survey of visual effects professionals and animators over the course of 2 weeks via twitter, Facebook and this blog and conducted on survey monkey. This is not a scientific survey, it's just a rough gauge of some of the issues for visual effects professionals around the world. Because no one monitors the visual effects industry there is a lack of any real data regarding companies and workers. The Croner survey is done for animation and visual effects companies so they know what the salary range is for different positions but otherwise wide spread information is severely lacking. I posted this survey in the hopes of getting a sense for any consensus on some of the various issues visual effects professionals have to deal with. What are the priorities of vfx professionals? We talk about hours and other problems but how much of an issue are they? Do they vary by location? I focused on issues that the visual effects companies have some control over and that are measurable. I've avoided asking about things such as respect or good projects. While important issues for individuals these are not something easily measured or controlled by the visual effects companies. This data will be submitted and used by the VES Strategic Committee and I'm making it available here for reference. In the end 663 people from around the world filled out the survey. The other countries had less than 5 people each. China had 3 people report and I have included that in some of the following charts just to have a data point. 27 people did not provide location information so won't be used for the location info section. 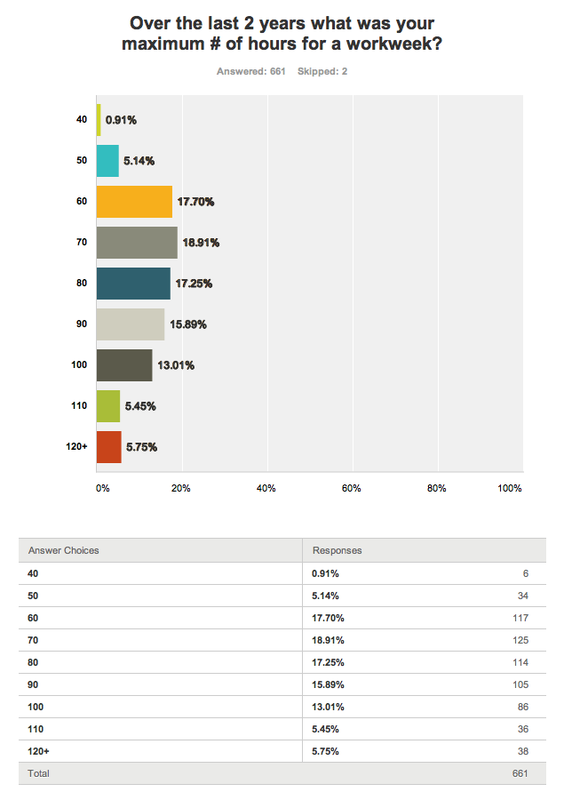 663 people responding to the survey isn't bad but with thousands of people in the industry (unknown exactly how many are in any one region, let alone the world), the sample is only a rough sample and can only represent those that took the survey. The small number of sampling in some countries can greatly skew the results so don't extrapolate these into representing a majority of cases. I've tried to double check the calculations but if you see something amiss go ahead and flag it. 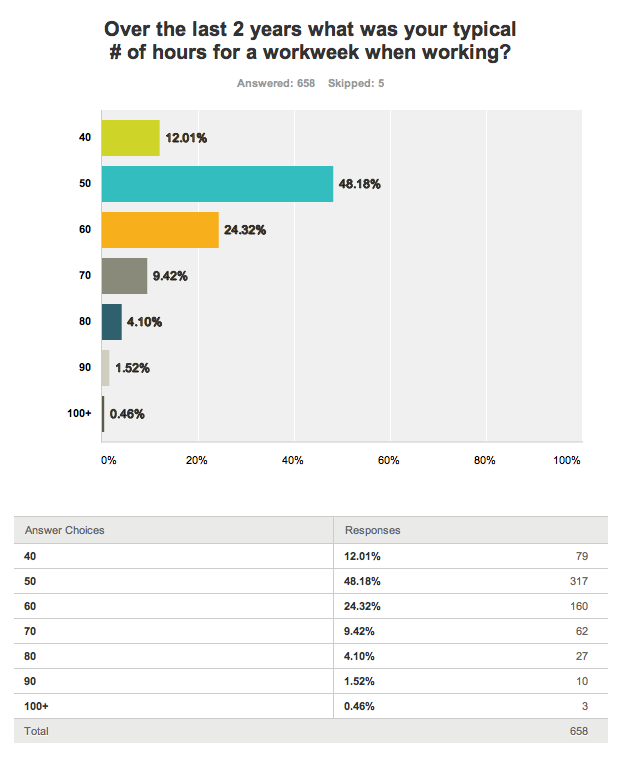 The next several charts are what the survey web site provided. 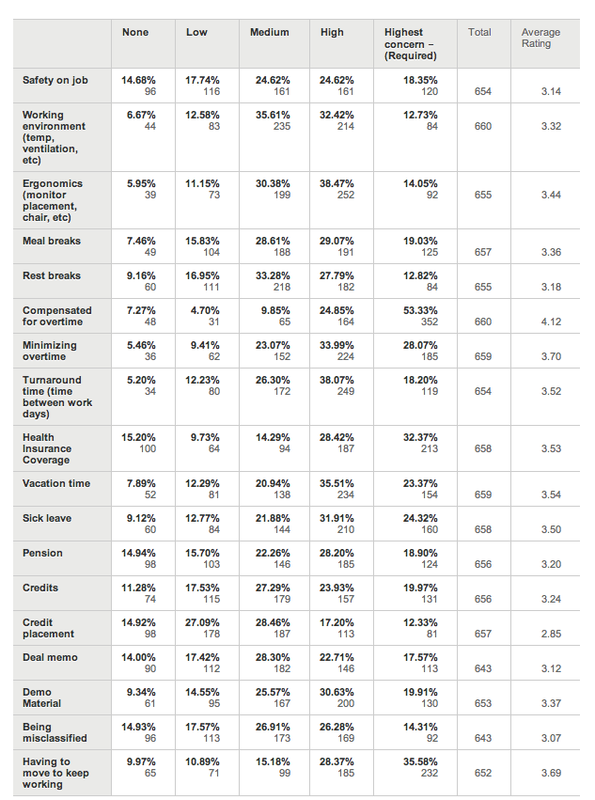 After the charts are corresponding tables of the actual values. Note the values are averages. These are for all the survey results (global). I ran numbers in Excel to get Median values, which I think are much more useful, as well as breakdown by country. These are posted at the end. The first two questions have values of 1 to 5 in terms of no importance to highest for each topic. Priority of 5 meant that it was a requirement or a big concern. Company meets needs, a 5 indicated the company was doing very well at meeting the needs. It was interesting that every topic received some 5's and some 1's, so something that was critical to some people was of very little concern to others. And that's why the averages shown in the first batch of data points is not as interesting as the median values that are listed later. The following data was sorted in Excel and shows Median values in addition to Averages. Priorities is the importance of what professionals placed on each issue. 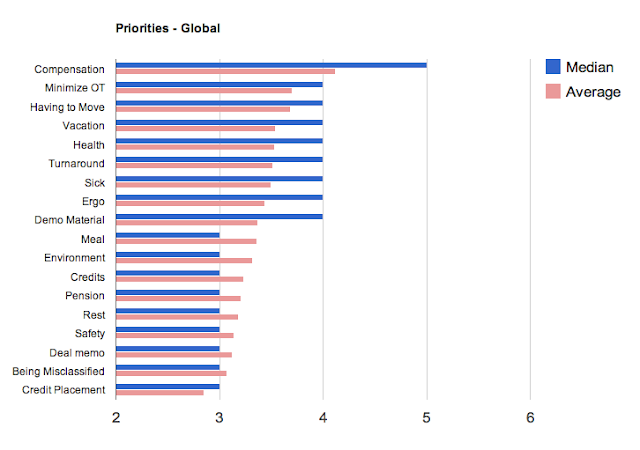 Below is the global priority list sorted. Here is the original list showing the comparison of different country responses. Yellow represents values below the Global values. Blue represents values above the Global values. Companies shows how well the companies are dealing with the specific issues from the worker's perspective. Small sample sizes provide questionable results for many countries. I've just completed organizing the numbers so haven't analyzed them in detail. I will do a follow up post with comments from those taking the survey. [Comments from the survey are now up ] There are certainly some differences between locations. Some of the attitudes about priorities are likely to be relative to the perspective at that particular location. 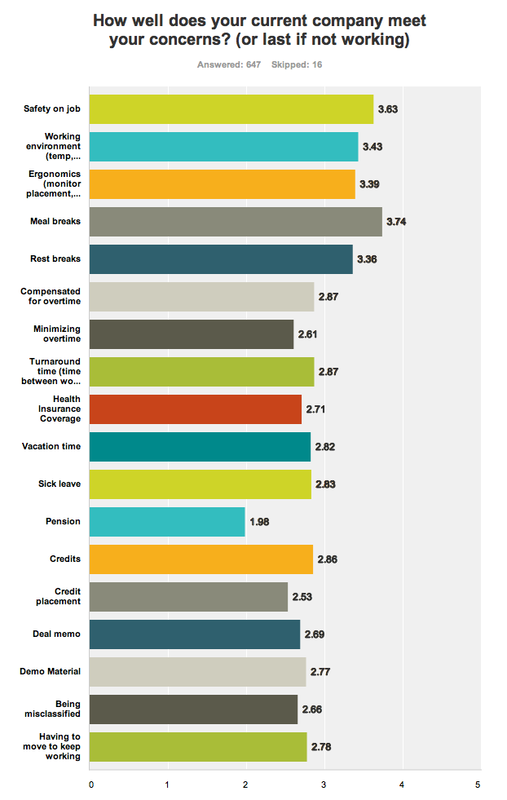 Compensation for OT, minimizing OT, and avoiding moving are the top in most countries. Low on the list is credit placement. Doesn't mean it's not an issue but other more pressing matters. And to be clear anything marked as compensation pertains to being paid for Overtime when it is worked. 'Compensation for all hours worked' is just what it says. This is not to imply higher wages but simply being paid for work done. 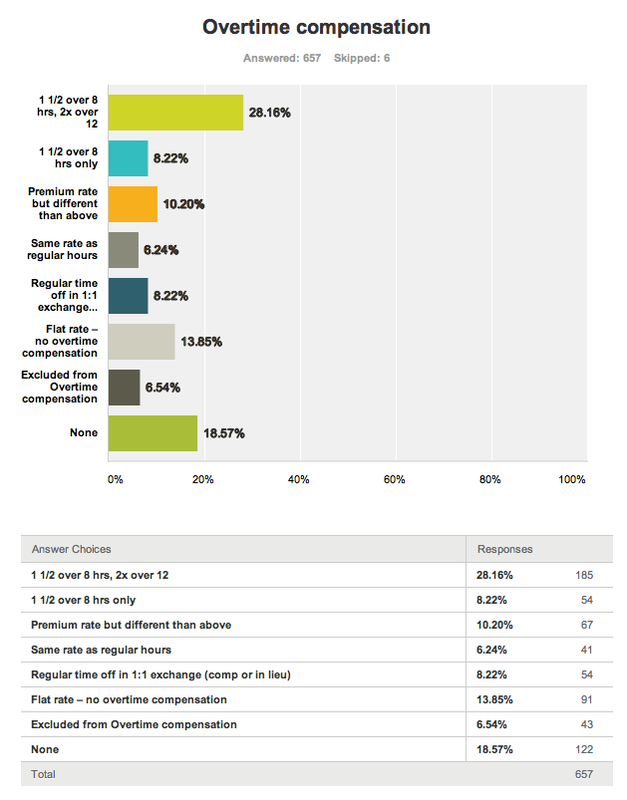 Almost 39% receive no OverTime compensation on a global average. 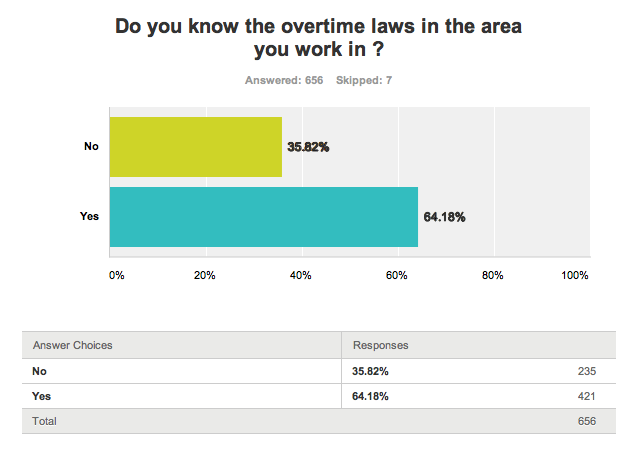 Almost 36% don't know the overtime laws in their location. 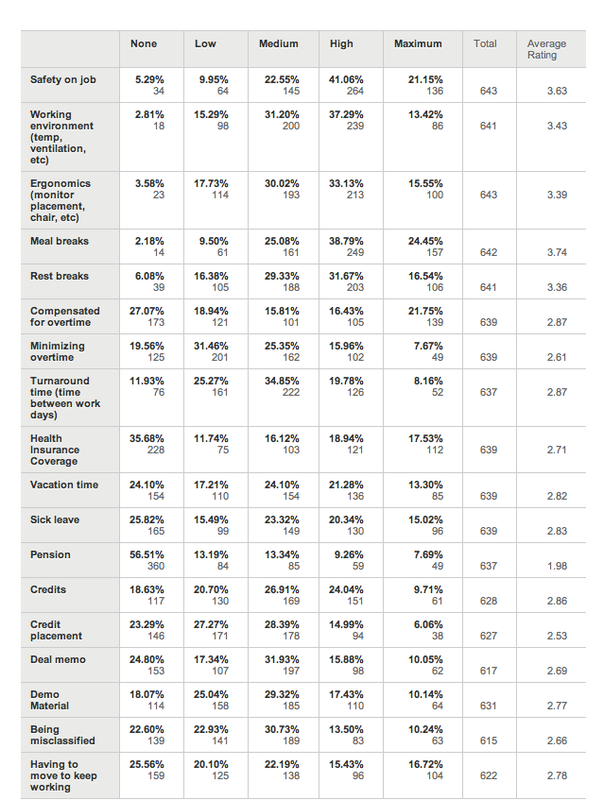 14.46% get regular pay(or comp time) instead of overtime pay. Those who had to put in 24hrs or more in a continuous day were 2nd only to those who had put in 14hrs a day. 50hr work week is most standard 'normal' week and 70hr more likely heavy week. [Updated 6/18/2013 Added a couple more paragraphs because I want to make sure the numbers sink in and don't just appear as numbers on a chart. The bottom line is visual effects professionals are putting in a lot of hours, frequently beyond limits set by both countries and some industries. And many of the hours are not compensated so a majority of these workers are being exploited unless their pay is correctly calculated to cover heavy overtime. First, thank you to everyone who took the survey. Hopefully this will shed some light on issues for visual effects workers around the world and help to show similarities and disparities between areas. There have been other surveys done in the last year by VFX Solidarity, the UK VFX group and others. I'll try to post links to those here. This information could at least be the start of research for both guilds and trade association. More surveys will be likely coming from a number of groups including the Visual Effects Society. I'm still pushing for workers to come up with a Code of Conduct addressing these issues. If you wish to have a voice in the future of visual effects you will have to speak up and make yourself heard. Participate in surveys, post comments, post you own blog, get involved with forums, etc. If you have other issues or solutions please go ahead and post them in the comments. Last week someone wrote a comment to a post I had, that I did not cover issues and solutions in non-LA areas. For the same effort they could have listed their specific issues and solutions in the comments. And again, very little I've posted has been LA specific. See VFX World Wide PI talk which lists issues and solutions. With the exception of health care, ALL of the issues were world wide. Subsidies have a huge influence, good or bad, no matter where you work. We are not working locally for local markets. The visual effects industry is global with work being done around the world and with many professionals having to move around the world. Any change in any area will affect you. Massive Overtime and unpaid work hours are problems all around the world. See the survey results. The solutions included a global trade association and guilds among other things. For those who think guilds are LA centric, many guilds cover the entire US. Also note that most countries of the world have guilds and many have specific film related guilds, including Canada and the UK among others. And yet there is an amazing amount of ignorance or denial regarding all of these things. See Visual Effects Guilds to learn more about guilds. For those who wish to see improvements to this industry, have courage to stand up and be heard. It's in your hands. The time for finger pointing or waiting for someone else to solve all the problems is over. If you have thoughts or insights based on the survey results please leave them in the comments below. If you have suggestions for future survey questions you think are important go ahead and leave those in the comments section as well.